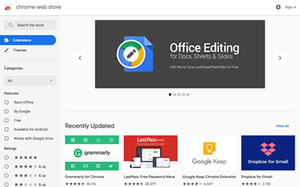 The Chrome Web Store (CWS) is Google's online store for its Chrome web browser. CWS hosts thousands of extensions and web apps. CWS opened in December 2010. A year later it was redesigned to "catalyze a big increase in traffic, across downloads, users, and total number of apps". As of June 2012, there were 750 million total installs of content hosted on CWS. Some extension developers have sold their extensions to third-parties who then incorporated adware. In 2014, Google removed two such extensions from CWS after many users complained about unwanted pop-up ads. The following year, Google acknowledged that about five percent of visits to its own websites had been altered by extensions with adware. Malware remains a problem on CWS. In January 2018, security researchers found four malicious extensions with more than 500,000 combined downloads. Chrome used to allow extensions hosted on CWS to also be installed at the developer's website for the sake of convenience. But this became a malware vector, so it was removed in 2018. ^ Kincaid, Jason. "Sales Are At A Trickle On Google's Chrome Web Store". TechCrunch. Retrieved 4 January 2011. ^ Empson, Rip. "New Chrome Web Store Proves To Be A Boon For Developers Above (And Below) The Fold". TechCrunch. Retrieved 5 December 2011. ^ Vikas SN (2012-06-29). "The Lowdown: Google I/O 2012 Day 2 – 310M Chrome Users, 425M Gmail & More". MediaNama. Retrieved 2013-06-14. ^ "Adware vendors buy Chrome Extensions to send ad- and malware-filled updates". Ars Technica. Retrieved 20 January 2014. ^ Bruce Schneier (21 Jan 2014). "Adware Vendors Buy and Abuse Chrome Extensions". ^ Winkler, Rolfe. "Google Removes Two Chrome Extensions Amid Ad Uproar". blogs.wsj.com. Wall Street Journal. Retrieved 17 March 2014. ^ "Ad Injection at Scale: Assessing Deceptive Advertisement Modifications" (PDF). Archived from the original (PDF) on 2015-06-05. ^ "Superfish injects ads into 5 percent of all Google page views". PC World. IDG. ^ "Superfish injects ads in one in 25 Google page views". CIO. IDG. ^ a b "Security firm ICEBRG uncovers 4 malicious Chrome extensions - gHacks Tech News". www.ghacks.net. Retrieved 2018-12-15. ^ "Google's bad track record of malicious Chrome extensions continues - gHacks Tech News". www.ghacks.net. Retrieved 2018-12-15. ^ "Chrome Extension Devs Use Sneaky Landing Pages after Google Bans Inline Installs". BleepingComputer. Retrieved 2018-12-15. ^ "Chrome's inline extension install ban already bypassed - gHacks Tech News". www.ghacks.net. Retrieved 2018-12-15. ^ "Google Chrome extensions with 500,000 downloads found to be malicious". Ars Technica. Retrieved 2018-12-30. ^ "Using Inline Installation - Google Chrome". developer.chrome.com. Retrieved 2018-12-14. ^ "Improving extension transparency for users". Chromium Blog. Retrieved 2018-12-15. This page was last edited on 13 April 2019, at 04:11 (UTC).